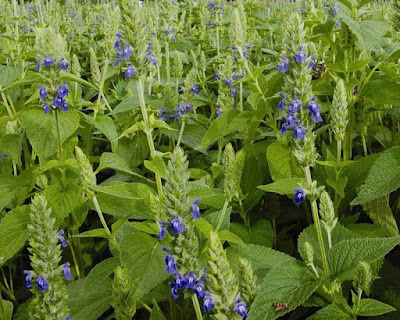 Chia (Salvia Hispanica) other names: Chía, Chia Fresca, Chia Grain, Chia Oil, Chia Seed, Chia Sprout, Germe de Chia, Graine de Chia, Graine de Salba, Huile de Chia, Pinole, S. Hispanica, Salba, Salba Grain, Salvia hispanica, Salvia Hispanica L.
Chia (botanical name Salvia hispanica) belongs to the mint family and is indigenous to Mexico as well as some regions of South America. In ancient time, Aztecs used the seeds of this herb as their staple food. Even to this day, chia seeds are consumed by people in different parts of the globe. Chia is an annual herb that grows up to a height of 1 meter (3.3 feet) and bears leaves that appear opposite to each other on the stem. The leaves are generally 4 cm to 8 cm (1.6 inches to 3.1 inches) in length and about 3 cm to 5 cm (1.2 inches to 2.0 inches) broad. The chia bears white or purple flowers. The chia flowers appear in clusters at the apex of a spike at stem terminals. The flowering season starts at the middle of the summer and it continues for roughly six weeks. 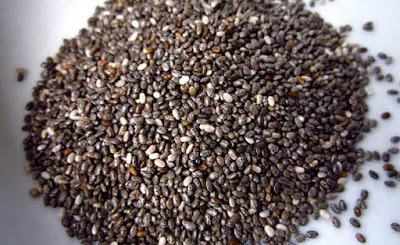 In several parts of the world people grow chia commercially for its edible seeds, which contain loads of omega-3 fatty acids. As about 25 % to 30% of chia seeds comprise extractable oils, counting α-linolenic acid (also known as ALA). Of the total fat contained by the chia seeds, oils comprise 55%, while the saturated fat content is about 18%. The remaining part comprises other nutrients. Typically, chia seeds are small and oval shaped measuring approximately 1 mm (0.039 inch) across. The seeds are mottled with variations of white, gray and brown. Chia seeds have a propensity to absorb water (hydrophilic) and each small seed has the capacity to soak up liquid as much as 12 times its weight when it is immersed in any fluid. When the seeds are soaked they develop a mucilaginous (moist and sticky) covering that gives all beverages made from chia seeds a characteristic texture. Although people in Mexico as well as in some south-western regions of the United States have been consuming chia seeds traditionally, people in Europe are not very familiar with this food. It is worth mentioning here that chia, also known as chien or chian, has more often than not classified as Salvia hispanica L. In present times, commercial cultivation of chia is undertaken in Mexico, Argentina, Bolivia, Ecuador, Guatemala, Nicaragua and also Australia. Although another species called Salvia columbariae or golden chia, which is akin to Salvia hispanica, is also used as chia, commercial cultivation of this species for use as food is yet to be undertaken. 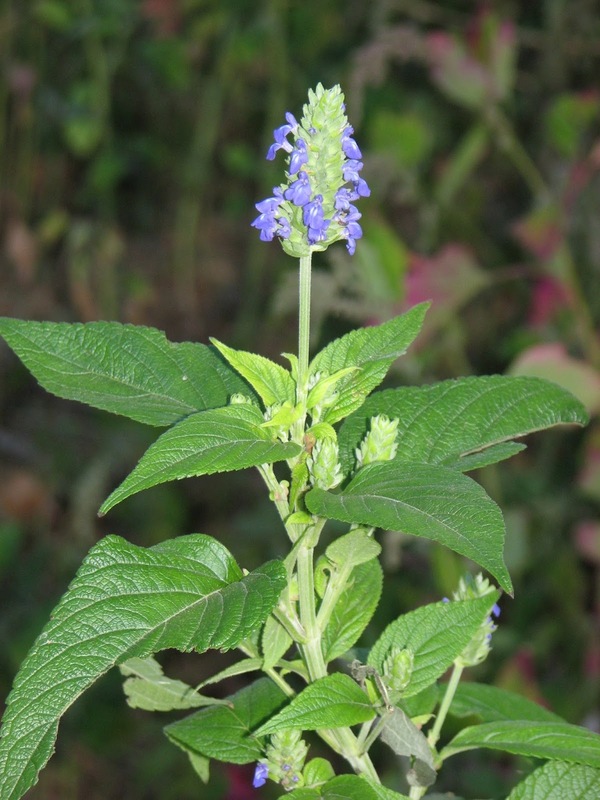 Usually, Salvia hispanica seeds are commercially marketed as ‘chia’ (the common name of the species). However, it is also sold under various different trademarks. Although chia has been safe for human consumption and is extensively used in the form of a staple food in some parts of the world, when harvested in high humidity, the seeds of chia are not safe for consumption. If the seeds are harvested when the climatic condition is very moist, they are likely to be affected by yeast, mold and salmonella. Chia plants are generally propagated by their seeds, ideally sown during March or April inside a greenhouse. It takes about two weeks from the date of sowing for the seeds to germinate. After the growth of the seedlings is for handling, prick the seedlings out one by one and re-plant them in individual pots or containers during the later part of spring or beginning of summer. On the other hand, you can also sow the chia seeds during April and May in situ (in their permanent place of growth outdoors). However, when you sow the seeds in April/ May, the plants may not mature to produce seeds during the cool summer. Chia needs a fertile, light or medium textured soil with a good drainage system. The plants require a warm sun-light position. Plants of these species do not possess the aptitude to endure frost. In Mexico, these plants are cultivated extensively for their edible seeds. 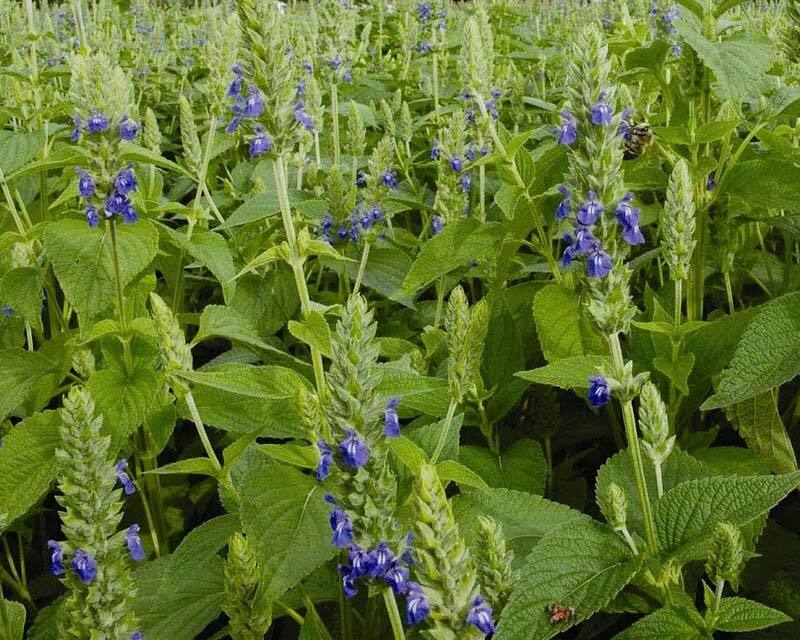 In fact, several plants that are cultivated as chia actually belong to the Salvia lavandulifolia species. Browsing deer seldom disturb the plants belonging to this genus. It is interesting to note that among all plants, chia contains the maximum amount of omega-3 fatty acids. It is the best source of this nutrient in the entire plant kingdom. Chia provides us with complete protein and it encloses the entire amino acids. In fact, chia is a very important food for all vegetarians. As chia contains elevated amounts of omega-3 fatty acids, it is very useful for lowering low-density lipoprotein (LDL), also known as ‘bad’ cholesterol, as well as triglycerides. Consumption of chia makes one feel full and thereby aids in regulating your appetite. When soaked in water, chia seeds absorb much of the liquid and grow as much as 12 times its original weight. The water consumed along with chia is mainly responsible for this feeling. These seeds are also easy to digest. Chia is an excellent food for women during pregnancy as well as nursing mothers, as it facilitates the growth as well as restoration of tissues. The seeds of chia are also beneficial for people suffering from hypertension (high blood pressure), as they work to bring down the blood pressure. As mentioned earlier, chia seeds contain the utmost amount of omega-3 and omega-6 fatty acids contained by any plant species. As our body does not possess the aptitude to synthesize essential fatty acids (EFAs), it is extremely vital that we acquire enough of these nutrients to adequately support the cardiovascular, immune, and reproductive as well as nervous systems. It has been found that deficiency of EFA is a common problem among people in North America. Chia seeds are also useful for people who are struggling to lose weight, as they inhibit the pace of complex carbohydrates digestion and their subsequent assimilation into our body. These seeds also contain soluble dietary fiber, which aids in keeping the glucose levels in the bloodstream stable, thereby releasing a stable as well as sustained level of energy all through. A study undertaken on people suffering from diabetes showed that after they took chia seeds regularly for three months, their blood became thinner, and was also less inclined to form clots. At the same time, their blood pressure reduced considerably. It is worth mentioning here that the name ‘chia’ has been derived from the Mayan language and it denotes strength. It has been found that the seeds of chia contained a balanced proportion of fats, fiber, carbohydrates and protein. It has been found that just one tablespoon of chia seeds possesses the aptitude to sustain an individual for as long as 24 hours. Many athletes have confirmed that consuming chia seeds helped to improve their performance. They reported that their performance has been of optimal levels and also for an extended period of time after consuming chia. Chia is also said to be beneficial for people with arthritis. Several people suffering from arthritis have asserted that taking chia seeds regularly for a few weeks helped to reduce the pain and inflammation associated with the condition. In fact, these seeds contain elevated amounts of omega-3 fatty acids, which are effective for lubricating the joints and also maintaining their suppleness. In addition, our body converts omega-3 fats into prostaglandins, which are said to be effective in alleviating pain as well as inflammation. Chia seeds are packed with essential fatty acids (EFAs), which work to boost the metabolic processes and also support lean muscle mass. Occasionally, chia seeds are included in our food with a view to provide us with bulk as well as nutriments, in addition to providing us with some calories. These are the main reasons why several people find chia to be an effective food for losing extra weight and sustaining an ideal healthy weight. Like psyllium, chia seeds swell manifold when they are soaked and this action facilitates the cleansing as well as soothing of the colon. The seeds take up toxic substances from the colon and, at the same time, reinforce the organ’s peristaltic action (successive contraction and relaxation of the muscles). As much as 20% of the chia seeds are made up of protein - much more than what is present in different grains like rice and wheat. In addition, chia seeds also enclose a compound called strontium, which is useful for the assimilation of protein into our body and generation of elevated levels of energy. Above all, the seeds of chia are also a wonderful natural resource of antioxidants. In fact, chia contains several times more antioxidants compared to freshly obtained blueberries. Such elevated amounts of antioxidants in chia seeds prevent the oils enclosed by them from decomposing. In other words, the antioxidants work to enhance the shelf life of these essential oils. In addition to their use as a staple food and medicine, chia seeds are also used for various other culinary purposes. These seeds turn into a jelly-like mass when they are immersed in water. This gelatinous substance is then flavoured by adding suitable fruit juices and consumed in the form of a cooling beverage. The jelly-like seeds are also used to prepare puddings and gruels. Sprouted chia seeds are consumed after adding them to salads, soups, sandwiches, stews and other such preparations. As the chia seeds have a mucilaginous (moist and sticky) property, usually they are sprouted on clay plates or any other earthenware made from porous materials. You may also grind chia seeds and blend the powdered form with cereal flours to prepare a meal or make breads, cakes, biscuits and other similar foods. The seeds of chia are an excellent protein source and fats, which are digested without much difficulty. High triglycerides: Blood contains several types of fat, including cholesterol and triglycerides. Triglyceride levels are too high in some people. Eating some types of chia can make them even higher. If you have high triglycerides, stick with using a specific variety of chia called Salba. Salba does not significantly increase triglyceride levels.